The following article was taken from mcroadtrip.com. Hello folks, Geno here. The best piece of advice I think I could ever give anyone is to “ride your own ride”. I’m not talking about riding your own motorcycle. I’m talking about riding within your own skillset. 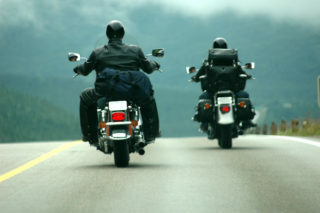 Most of us who ride, have ridden with others who may be more experienced, a little daring, or even careless and reckless. But just because someone else takes a chance, doesn’t mean we have to follow suit. Trying to keep up by racing through a yellow light. I know I’m guilty of this. But when you consider how many bikers are taken out in intersections, speeding up to get through one is not always the best idea. Your riding buddies aren’t going to leave you behind. They will either slow down and stop at the yellow light, or they will pull over and wait for you on the other side. It’s no big deal. Just be sure that before you twist the throttle to speed into the middle of an intersection, you won’t T-bone, or get T-boned. Never trust an automobile driver to do the right thing when it comes to sharing the road with you and your bike. Never! Weaving in and out of traffic, making abrupt lane changes. When riding in a congested highway situation, I tend to ride a little more aggressive to stay out of the herd. I like to either get out in front of the cagers, or settle in behind them. Sometimes that means speeding up and making a couple of lane changes to find my comfortable spot on the road. You may need to do the same thing, but remember to pick your own path, throttle up and make your own safe lane changes. Don’t just try to follow the leader. There’s plenty of road in front of you to safely catch up. Riding on curvy roads and feeling the lean is one of the things I enjoy most when riding my motorcycle. For a new rider, curves can sometimes be a little intimidating. Again, stay within your ability when riding curves. There has been many a rider who ran off the road, or lost traction in a curve by hitting it too fast and leaning too hard. Especially when you take into account the sand, pebbles, leaves, pine straw, etc., that may be lying in wait to booby-trap you. If you haven’t done so already, be sure to read my recent article on counter-steering. If you use counter-steering, the curves become much less stressful, and much more fun. Dirty Harry said, “A man’s got to know his limitations.” Obviously that goes for women too. Passing vehicles is another area where we need to know and adhere to our own limitations. There are many things to consider when passing, especially on a two-lane road. 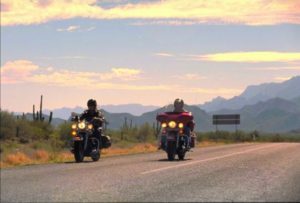 It’s critical to know the power of your motorcycle, your ability to handle your bike at higher speeds, how much room you have to get around, wind buffering, animals running into your path, semi trucks throwing trash and recaps, etc. If your riding buddy passes another vehicle, before you launch, make sure you aren’t just following the leader, and that you are riding your own ride, safely. There is so much more to say about riding your own ride, but I’ll leave it here and look for some of your own experiences and advice in the comments below. Photo Credits: Thanks to the photographer who shot these two great photos. Click on the arrow below to hear our latest radio commercial! Come join us at our own local Bikes, Blues & BBQ on November 7th. With rates as low as 5.40% APR, you can finance your motorcycle loan with us between November 7-21, and receive a $100 VISA GIFT CARD. CLICK HERE for more info . . . Hot Times in the Old Town Tonight!